RESORT FEES AND TAXES ARE ALL INCLUDED!!! Please contact me regarding to rates as not all rates are uploaded far in advance! This suite will have NO RESORT FEES! This One Bedroom Deluxe Suite offers the BEST views at Trump Las Vegas. My Suite is 910 sq. ft, located on HIGH FLOOR with SOUTH STRIP VIEW, you can even see an obstructed view of the fountains of the Bellagio!!! - These are ACTUAL pictures of the suite, not downloaded ones! - One Bedroom Deluxe Suite / Non-smoking! - The living room features a separate full bath, a second LCD HDTV, coffee table and the sofa is a pullout to Queen bed. Sleeping arrangement: It is extremely important to highlight, this is a 1 bedroom suite! There is 1 bedroom, which has an oversized king bed. The living room has a couch which can be converted into a queen size pull-out bed. ONE additional roll-away bed can be requested (no charge) should there be a need for them. The living room has 1 full bathroom and the bedroom is connected with another full (master) bathroom. - Cleaning CAN be arranged (for surcharge)! Should this interest you please contact me BEFORE making the booking! You will always be treated as a VIP from our initial contact until you leave. Upon booking you will have all my contact information and you can expect a speedy response from me at all times. I will strive to win your business over and over again and welcome you back to my unit as my old acquaintance. I am also happy to help you out with show, dining and other activity tips as well as you will have a concierge service at Trump at your disposal! Just tell me how I can make your stay memorable and I will do my best to accommodate your requests! The Fashion Show Mall is literally next door, which provides an excellent array of shopping and a wide variety of dining options. Like Forum Shops better? Not a problem, the strip courtesy shuttle is yours to use for free which drops you off at Caesars. 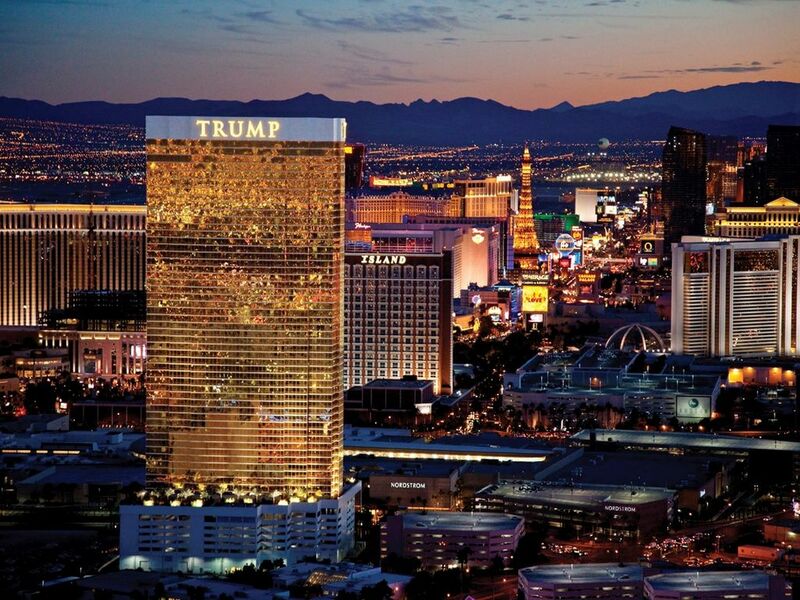 McCarran International Airport is located 3.2 miles from Trump (less than a 10 minute ride). english, french, german, spanish, portuguese, russian, italian, dutch, swedish, greek, czech, danish, norwegian, polish, hungarian, arabic, finnish, turkish, mandarin, I take reservations in any languages in writing! As a frequent renter myself, I know exactly what makes a stay unforgettable, therefore I always strive to make sure that your stay is beyond just 'good'. When you rent from me, I guarantee that I will always go out of my way to make sure that you have an amazing renting experience! You will be able to reach me 24/7 with anything you may need assistance with throughout your stay! Available only on extended stays! Pantry items are generally NOT provided by the hotel, but they are included in my suite. Dishes and Utensils are generally NOT provided by the hotel, but they are included in my suite. Nice suite, poor spare beds. Enjoyed the suite. Very nice, great view of the strip. The fold out bed and the roll away bed the hotel supplies we're terrible. Thank you so much for the excellent rating you have left for my home, I truly appreciate it! Wishing you safe travels and hope to host you again in the near future. This place is perfect for a family stay. Quiet, large, comfortable and clean. Many thanks Szilard! It was truly a pleasure hosting you and I appreciate you choosing my home for your Vegas getaway! Thank you for providing such a fantastic 5-star feedback and I am delighted to hear that your stay went greatly! Safe travels and hope to see you next time! Amazing host and excellent property. We had a wonderful time at this 1 bebroom 2 bathroom suite in the Trump International Hotel. We slept 6 people in the suite. The accommodations were excellent and the host made sure our stay was pleasant. We hope to be able to stay here again. Thank you for being such a great host! I have to say this is one of the best VRBO's I've stay in. The Hostess is very accommodating and very easy to work with if you had any issues. If you enjoy shopping your right next to the Fashion Drive Mall. The spa, pool and the gym are great. The staff are very pleasant and very kind. Loved my stay at The Trump Tower, will stay again. It was truly a pleasure hosting such great guests as you and your lovely family. I really appreciate that you took the time to write a fantastic review of your stay and I hope to get to host you again at some point in the near future.